As the more observant of you might have noticed it’s that time of year again when the British transport system grinds to a halt, schools are closed across swathes of the north-east, the number of ‘sick days’ skyrockets, and children everywhere seem permanently attached by their squished noses to to frozen window-panes; yes, there has been an inch of snow somewhere in the Highlands. Time to dig out those scarves and gloves, phone in sick, and head to the slopes with the dinner tray to whizz down the icy inclines. But what’s this? No, kids these days don’t want a homemade skeleton bob cobbled together from biscuit tin lids, they want one of these: Snow Scooter! Or so ‘Discount Vouchers‘ would have you believe. 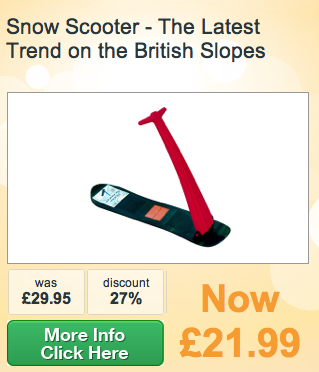 Described in the marketing as “The Latest Trend on the British Slopes” [I wonder where the mean.. surely mild inclines/ green and pleasant lands?] they retain at an eye watering £21.99 with another £6 hidden in there for P&P.